Things are really getting exciting and I feel like I’m bursting at the seams so thought I’d share some images with you all about the goings on. This pic is Dora and Gemma “dipping and frying”. This was on the first Foraging Friday where we had 6 seniors, 3 parents and 13 kids. Who knew how tasty maple blossom fritters could be? The foraging and cooking was easy with this group who is really starting to get the hang of THINGS FOOD. 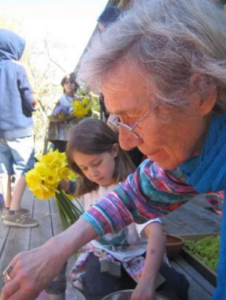 The day also included a visit to Rose’s pond, daffodil picking, rolling down the famous steep hill AND helping Rose with the heavy job of moving compost. Rose and Adrienne, who had never met, have found kindred spirits in each other. Another pic is of Elizabeth Latta at the school continuing her pea lessons. She has a way of speaking that is truly new to the kids. She was explaining how a pea’s first tendril searches and reaches out for something to attach to. The Food Forever gatherings, from kitchens to forests to our neighbours, are filling me with such joy and inspiration. Hope you all get a chance to connect with this special project.